No EFS support in Windows 7/8.1/10 Home Editions - PC Buyer Beware! 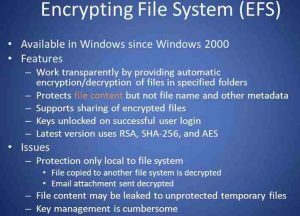 Do Windows 7/8.1/10 Home Editions support Encrypting File System (EFS)? EFS support is not available on all of the Home editions of every version of Windows from XP to Windows 10. There are no workarounds or hacks to enable it in the Home editions. 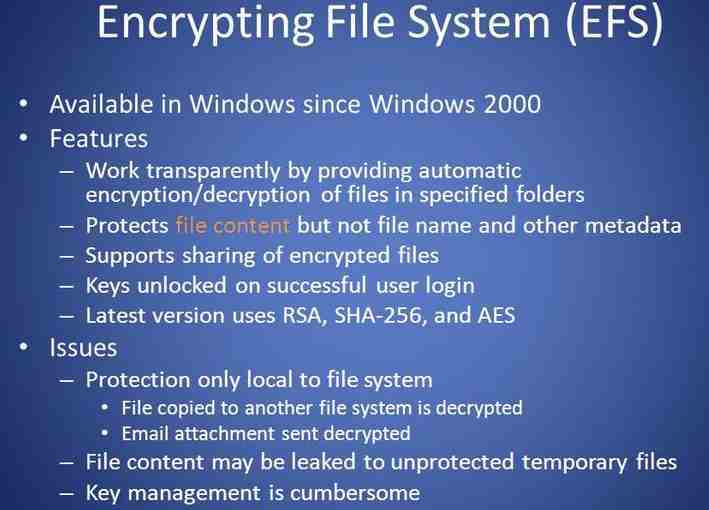 Windows’ Encrypting File System (EFS) is not active by default, the user has to choose to enable it. It encrypts files on a computer so that no one who has physical access to that computer can gain access to their contents. If the computer is stolen, reading or viewing the contents of any of the files or images is not possible. Implemented encryption on a file, directory or whole-drive basis. It is possible to enable certain EFS settings via Group Policy in Windows domain network setups. Users are provided with the recovery certificates and private keys that are used to encrypt and gain access to the files. Encrypting files is simple, you just have to right-click on the file or folder or drive (under My Computer or Computer) that you want to encrypt, open Properties and enable the relevant check box. EFS support is not available on all of the Home editions of very version of Windows from XP to Windows 10. There are no workarounds or hacks to enable it. If any Windows Home users want to make use of EFS, they have to upgrade to a Pro or higher edition of Windows. However, it is possible to set up file sharing or remote-desktop access on a local network to share access to unencrypted files. If you want to share encrypted data between different editions of Windows, say, between Windows 10 Home edition and Windows 10 Pro, you can use a third-party encryption tool, which would be just as secure as EFS and would work on all current versions and editions of Windows. For example, you could use the free 7-Zip to encrypt all of the files and folders that you want to protect on your computer or stored online by using Microsoft’s OneDrive storage facility that is provided with a Microsoft account, such as one created at Outlook.com. If you have files that contain sensitive private information, you should always encrypt them before storing them online. 7-Zip uses AES-256 encryption that cannot be cracked as long as a strong password is used. The files can be accessed and decrypted while using any edition or version of Windows from Windows XP to Windows 10. July 15, 2017 in Software Problems, Windows XP/Vista/7/8.1/10 Problems.